Geremia Valocchi first appears in the Painesville, Ohio, area in 1920. In America, Geremia Valocchi was known as James Valocchi. Geremia Valocchi, son of Pietro Valocchi and Lucia DiLizzo, was born on January 20, 1903, at Caruffo at Italy. He married Cecilia Arcaro, daughter of Anthony Arcaro and Filomena Vacco on February 18, 1928, at Ashtabula, Ashtabula County, Ohio. Geremia died on July 6, 1963, at Mesa, Maricopa County, Arizona, at age 60. His body was interred at Mesa Cemetery at Mesa, Maricopa County, Arizona. Geremia Valocchi, age 17, immigrated to the United States on November 14, 1920, travelling to Painesville, Ohio. He was travelling with his nephew, Nicola Ciprietta. They were joining Vitale Valocchi in Painesville. James Valocchi became a citizen of the United States on June 11, 1934. James resided at 341 Sanford Street, Painesville, Lake County, Ohio, when he was Naturalized. 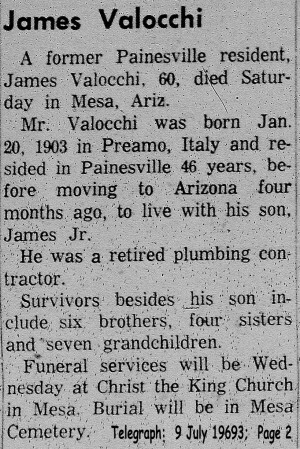 James Valocchi was employed as a plumbing contractor. Three of Geremia’s brothers also lived in Painesville, Ohio. Mattia Valocchi migrated to Painesville in 1915, Vitale Valocchi in 1913, Nazareno in 1917. 1. James Valocchi was born on November 20, 1929, in Ohio.